A UC Santa Cruz alumnus and a current student watched in the Oval Office earlier this month as President Obama signed the historic bill that cuts student loan interest rates. Another alum helped lobby for the bill days before it was passed. Only 13 guests were present to witness the August 9 White House signing. 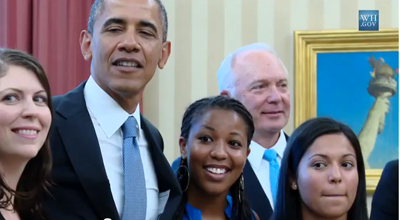 In addition to congressional leaders responsible for pushing the bill through Congress, White House officials invited UCSC alumnus Kalwis Lo (Stevenson, politics and education, '11) legislative director for the United States Student Association (USSA), and Wanjiku Muhire, (College Nine, legal studies and politics, '14) a USSA summer intern. The president praised the student advocates for their work lobbying for the bill that links student loan interest rates to financial markets, cutting them in the short term. 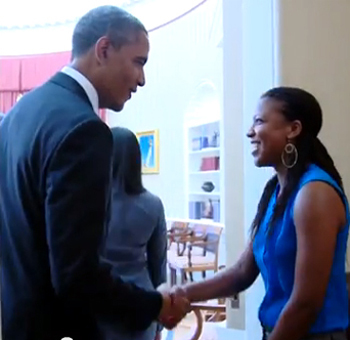 On July 22, UCSC grad Tiffany Dena Loftin (Oakes, American studies and politics, '11), the outgoing USSA president, and three others were invited to meet with the president to offer a student perspective on the pending bill. Congress passed the compromise legislation nine days later. The USSA was founded as the National Student Association in 1946 and is the largest, student-run and student-led organization dedicated to advocating for students in the United States. It is well represented by UCSC grads and students. In addition to Loftin, students Ivan Medina (Porter), Kevin Huang (College 10), and Erica Ayon (College 10) have leadership roles in the organization. Muhire said the White House visit "was a very special moment of my summer, let alone my life" and it also helped bring some family history a bit little closer. Muhire's mother was born and raised in Kenya and her mother's uncle was a friend of the president's father. She recalled a photo that surfaced during the 2008 campaign showing her great uncle having a picnic with Obama Sr., an event that brought a lot of excitement for her family. "So when my picture came out of me standing next to President Obama, my family was thrilled as much as I was honored to be there," she said. But a more tangible highlight, Muhire said, "was President Obama taking a stance on what has been a constant uphill battle for students even prior to me attending UCSC. Being able to witness a piece of history was an honor and a humbling experience that means we are now but a step closer to making college more affordable for all students." Muhire returns to campus September 2 for resident assistant training at College Nine.